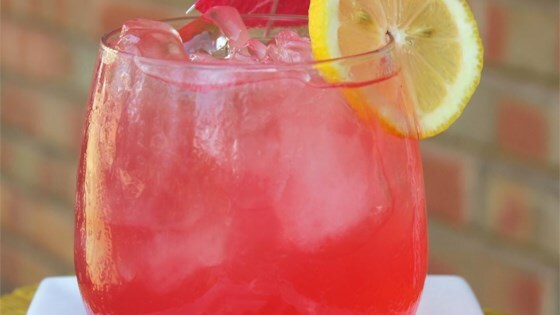 "Refreshing, fun recipe for blueberry lemonade! Tart and sweet with a boost of antioxidants from the blueberries. The finished drink is hot pink, almost purple." Boil one cup of water with the sugar in a saucepan over medium-high heat, stirring until the liquid becomes clear. Remove from heat and stir in the lemon juice. Pour 7 cups of cool water and ice into a serving pitcher. Add the lemon syrup and blueberries; stir until you get a 'hot pink' color. Pretty easy and very delicious. I used lemon juice from concentrate and only used 2 cups of the lemon juice. I also used frozen rather than fresh blueberries! Hits the spot on a hot day. This is awesome! First, I couldn't get it to turn hot pink, but after I left it over night with the blueberries, it came out very much hot pink! I made it for a party and everyone loved it! This was delicious! I like the blueberries whole myself, my family wanted them strained, so I just used a pitcher with a slotted spout! Great variation on an old favorite ! ENJOY!